A Toll Road was opened from Hockliffe to Woburn in 1706, and this was the first such Toll Road in Bedfordshire. This allowed the appointed Trustees to charge a fee for nearly all traffic and travellers who used it, and to use the money so raised to maintain a proper road and keep it in good repair. In the times before local authorities, this was the best way to get country roads into an acceptable condition, as they were often no more than well-worn tracks in mud, and professional upkeep meant passenger coaches and goods could travel with less fear of breakdown, and with less horses. 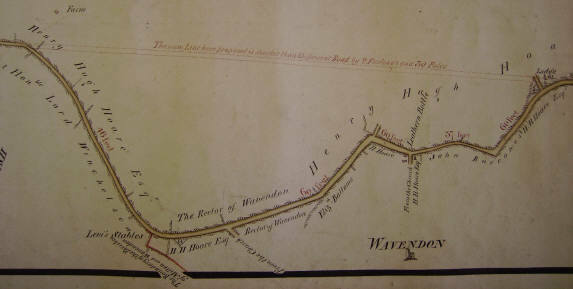 In 1727, a futher extension was set up, extending the road northwards, through Wavendon to Newport Pagnell. This was then renewed in 1742. It was part of the London to Manchester route, which branched away from the London to Chester route at Hockliffe. After Newport Pagnell, it ran through Northampton, Leicester, Derby and Buxton. There were six Acts in force along this route before 1720, and by 1750, only 14 miles of it remained un-tolled. 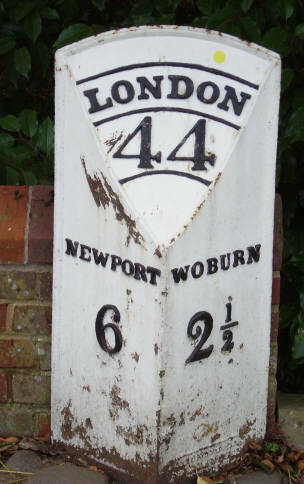 Locally, one tollgate stood a mile south of Woburn, (near the lane to Potsgrove); the next was beside the Weathercock Inn, in modern Woburn Sands, and the next at Broughton village. The gate at the Weathercock was added later than the others. 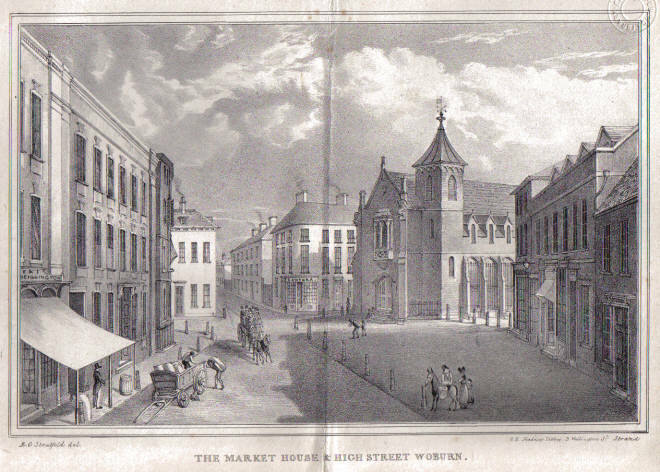 It was first brought up in the minutes of the Trustees Meeting in 1832, and it is recorded that they thought it would be expedient to build a new gate there, as traffic was coming down Weathercock Lane. They proposed to charge 4d. for any horse or beast with wagon with 6-inch wide wheels or more, and 6 3/4d. for wagons with wheels less than 6-inches. This is because thinner wheels damaged the roads more. A score of horned cattle would cost 1s., and 5d. for a score of sheep. Paying at the Weathercock Gate would exempt you from paying at either Woburn or Broughton. However, no further mention is made of this gate in any minutes until the subject was brought up again in 1846, when the Trustees considered erecting a new gate at the Weathercock, but thought it not presently neccesary. In 1856, a special meeting was called to consider the Weathercock Gate, and it was decided to erect one. So was the gate not built in 1832, or was this a replacement? There were almost immediate complaints from the coal dealers who had based themselves at the Woburn Sands Station nearby. They petitioned for a reduction, and settled for a discounted advance payment. The next year, a barn and a garden was added to the toll-house, which stood just by the entrance to the Recreation Ground we know today. The pennies and shillings charged by the toll collectors soon mounted up. In 1729, the Trustees took a total of £212 in tolls at the Woburn Gate alone, but spent out £510. Compare that to 50 years later in 1779 when they took £665 at Woburn, but still only paid the same out. 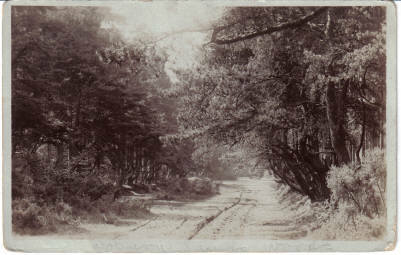 Several schemes were put forward to make the crossing of the sandhill between Woburn and Woburn Sands easier, and eventually a large cutting was made, and the ascent and descent that was left made much smoother by using the spoil left over. Before this, there was another pack-horse route through the woods to the east of the main road, where excess weight could be off-loaded to horses to allow the lighter carts to be pulled over the hill with ease. Woburn was the main local coaching station along the route, for offering services to travellers and fresh horses, but other inns along the road also would have benefitted from the traffic. There are 16 inns listed at Woburn in Dodds “Account of the Town of Woburn” in 1818, which also gives details of some of the carriers (including the firm of Pickfords) and coaches and where they stopped. The Tolls were in force until 1877. By then, the railway network and trains had made the old coach traffic seem slow and ancient. There is very little evidence of tollgates, etc. in Woburn Sands today. Toll houses would have been built in the verge of the road, so that the gate swung out easily, and the toll collector could sit in the warm and dry! These houses were usually demolished once local authorities took over the road network, as they were in the way of pedestrian pavements. The toll collecting stopped in 1877, and Weathercock Toll House does not appear on the 1880 O.S. Map. As well as the mile marker along Station Road, we ahve the much more modern development at the corner of Cranfield Road, called “Turnpike Court”, to remind us. The original published Acts are transcribed below. I have removed duplication and paraphrased them to leave the main points a little easier to read. Just as today, they were very specific about what is, and isn’t, allowed, to cover every conceivable eventuality. The late Arthur Parker researched the toll road, and deposited copies of his “The Woburn Toll Road 1728 – 1860” at Bedfordshire Archives and Records Service, and the Centre for Buckinghamshire Studies at Aylesbury. Friday, as Edmund Dicks, Esq; of Close End in Bedfordshire, was coming over Woburn Sands, he was robbed of twenty-three guineas by a highwayman, who observed that he had a watch, but refused it. About two o’clock last Friday morning the Derby Coach was robbed on Woburn Sands, by a single highwayman, who behaved in a very polite manner; he collected from all the insides, and took 4s 6d from an outside passenger, but returned him half a Crown, and giving the coachman a shilling, rode off. On Thursday night the Manchester Mail on its way to London, broke down as it was passing over Woburn Sands; the letters were conveyed to London in a chaise. Last Saturday night, about nine o’clock, two Gentlemen were robbed by a single highwayman, at a place called Hogstye End, on the Woburn Sands, between the town of Woburn and Newport, of cash and notes to the amount of 80l with which he got clear off. A few nights since, as Mr James Bayley, of Wroxhill Farm, in the county of Bedford, was travelling to Fenny Stratford, he was attempted to be stopped between the two public house at Hogstye End, by a man who jumped out of a hedge, and endeavoured to catch the bridle of his horse, who immediately plunged, and had nearly thrown him. Before he could recover himself, the ruffian fired at him in the back of the neck. Coach Robberies. On Thursday last as the Northampton coach was returning from town, when arrived near Woburn Sands, it was discovered that the door of the hind boot had been broken open and a number or parcels and other property of no very considerable value stolen therefrom. There was only one outside passenger besides the coachman at the time the robbery must have been committed, and they observed three very suspicious fellows pass the coach a short time before the boot was discovered to be open. Among other property, a travelling bag belonging to the Hon. Robert Smith of Sandhurst is missing; and this gentleman with a truly public spirit , has offered a reward of £50 for the apprehension of the offenders, a sum we believe very tar greater than the value of the property lost. Some text from the published Acts is transcribed below. I have removed duplication and paraphrased them to leave the main points a little easier to read. Just as today, they were very specific about what is (and isn’t) allowed, to cover every conceivable eventuality. 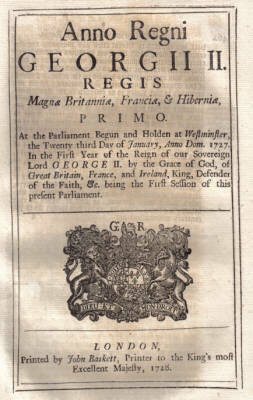 “In the reign of King George II, at Parliament at Westminster, 23rd day of January 1727. An Act for the more effectual mending the highway between Hockliffe and Woburn, in the County of Bedford; and for repairing the road leading through Woburn to Tickford Bridge in Newport Pagnell, in the County of Bucks. Preamble An Act for repairing the highway between Hockliffe and Woburn in the County of Bedford, passed in the fifth year of the reign of Queen Anne, will expire on 24th June, 1728. Great sums of money have been laid out in repairing the said highway; but it is not yet sufficiently amended, and is still very ruinous and out of repair. The highways from Woburn to Tickford Bridge in Newport Pagnell, in the County of Bucks (lying in the parishes of Wavendon, Middleton Keynes, Broughton, Moulsoe and Newport Pagnell, in the said county of Bucks) and a certain lane called Hockliffe Lane, because of many heavy carriages daily passing through the lane, have become very bad and dangerous to passengers, as material for mending it is not available locally. 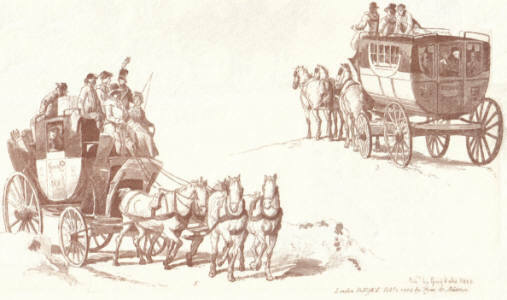 The Toll For every coach, drawn by four or more horses, one shilling. Collected Toll monies shall be used for repairing the roads (reasonable charges being first deducted) The Trustees may keep any horse or cattle belonging to someone who cannot pay their toll, until such toll, with reasonable charges for keeping said livestock, is paid. If after five days the toll is not paid, they may sell the goods so taken, returning any profit made to the owner, after all tolls and reasonable charges have been paid. Anyone permitting passage across private land to avoid paying the Toll, forfeits 10s. If any person owning, or occupying, any land near any gate or turnpike, for gain or otherwise, permits any person to pass through a gate with any coach, horse, or any sort of cattle; or if they take off a horse from a coach, to avoid payment of tolls, and they are convicted upon oath before a JP for the Counties of Bedford or Bucks, they shall pay the sum of 10s, which shall go one part to the informer, and the other part towards repairing the roads. The trustees can erect gates, or turnpikes on the side of the roads, and across any lane leading out of the road, to prevent frauds, and receive tolls at any gate or turnpike; as long as there is no double charge, in case of passing through any other turnpikes. All coaches, and passengers on horseback, shall pass and repass toll-free through any turnpike to be erected, on the day on election days for a Knight of the Shire to serve in Parliament for the counties of Bedford or Bucks. The Lord or Owner of the Manor of Battlesden, and his servants, and the tenants of the Manor, and all the inhabitants of the parish of Battlesden, shall be exempted from paying any toll. Trustees may choose Receivers, Surveyors and Co.
At their first meeting, the trustees shall choose collectors of tolls, for the gates and turnpike to be erected; and also a fit person to be a surveyor of the highway, and to see that the road be well repaired and amended, and that the money raised be duly applied; and they may also remove such collectors, or surveyors, as they shall see fit, and to appoint new ones in case of death or removal. On the first Tuesday in every month, if required by the trustees, the people appointed for receiving of the said tolls, and the surveyor, shall upon oath before a JP, give a true and perfect account in writing, of all monies which they have received, paid and distributed. All money received in Tolls will be paid to the Trustees, and they will pay the collectors, the surveyor, and also anyone else who has been assisting in mended and repairing the road, out of the money so raised. If the receivers or collectors do not make an account and payments, then the said JP at Special Sessions or Monthly Meeting, shall make inquiry concerning such default, as by the testimony of one or more credible witnesses upon oath, and if any person shall be therefore convicted, they will commit the person to the common goal of the said county where said offence shall be committed, there to remain without bail, until he has made a true and perfect account and payment. The surveyor, and anyone he appoints, can dig, take, and carry away any stone, gravel, furze, heath, sand or other materials, for mending the roads, out of any convenient part of any waste or common of any parishes, without paying anything for the same; as long as he fills up and levels the holes or pits (if required) in all such common or waste grounds, from where the stones, gravel or sand is taken. Where there is not enough materials in any common or waste ground nearby, the surveyor can dig, take, and gather the same in the grounds of any person (as long as it is not a garden, orchard, park stocked with deer, yard meadow, planted walk or walks, or avenue to a house) where such materials are found, and carry away as much as the surveyor judges necessary for repairing and mending the roads, paying rates for materials and for any damage done thereby to the owner of the ground, as the Trustees shall judge reasonable and in cases of difference concerning the price, the JP at the next Quarter Sessions shall judge. No such gravel, sand, stones or materials, shall be dug, gathered, taken or carried away within the parish of Battlesden, without consent of the Lord or Owner of the Manor of Battlesden. The surveyor may remove or prevent annoyances on any part of the roads intended to be repaired. Filth, dung, ashes, rubbish or otherwise, or by watercourses, sinks or drains, laid or running into the roads and to cleanse any ditch or watercourse adjoining to the roads, and to shroud, lop, or cut down any trees, boughs of trees or bushes upon or near the roads and to take away the same, in case the owner neglects to remove annoyances, or to cut or take away any such trees boughs, bushes, shreddings and lops. Owners of land will be given ten days to reimburse any costs involved to the surveyor. If after removal of any of the said annoyances, any person shall offend again, and being convicted before a JP, they shall for every such offence, pay the Trustees the sum of 20s. 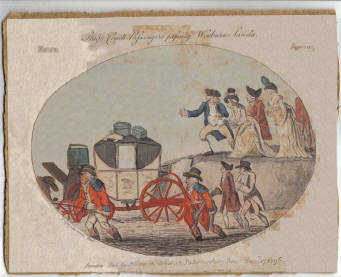 Even in 1796 carriages could still get bogged down! May make causeways and co. The surveyor may make causeways, cut drains through, and erect arches or bridges of brick, timber or stone, upon any part of the roads, and also widen any of the narrow parts of the roads by taking the grounds of any person lying beside the road (if it is not a house, garden, orchard, yard, planted walk or avenue to a house) and also make ditches or trenches for the better mending and keeping the roads in good repair, paying compensation to the owner of such ground taken, or on through which any such drain be cut, or on which any such arch or bridge be made. A JP, at the next Quarter Sessions, will decide in case of any difference concerning price. If any owner of any watercourses or ditch or that adjoins the roads, refuses to clean the ditches twice in a year, after ten days notice shall be given, the surveyor may let any man work to scour and clean the same, and charge the owner of the said ditch, or take and sell their goods, rendering any extra made to the owner, after any charges paid. If the money raised is not sufficient for the speedy repairing of the roads, the trustees may assign over the tolls, or any part thereof (the costs and charges whereof to be born and paid out of such tolls or duties) for any time, as a security for any sum of money to be borrowed for that purpose, to such persons, who shall lend the same, to secure the repayment thereof with lawful interest; which money to be borrowed shall be applied and disposed of, as the tolls are directed to be applied and disposed of, and to no other use whatsoever. If there shall be more than one gate or turnpike erected, no person having paid the toll at the first gate or turnpike, and producing a note or ticket that the toll was paid, shall be liable to pay any toll at any other of the gates or turnpikes the same day, or before twelve of the clock at night, of that day; and no person having occasion to pay the tolls, and who shall return the same day with the same horse, cattle, or carriage shall be liable to pay the said toll or duty a second time in the same day. Any cattle, coach or carriage that passes through any gate or turnpike and stops and stays the night following at any place on the road between any of the gates or turnpikes, the owner or driver of such of cattle, coach or carriage (upon producing a ticket of such payment) shall not be obliged to pay any toll or duty hereby imposed for passing through any other turnpike or gate the next morning. To prevent frauds and abuses in the tolls or duties, if any person, having paid the toll and having a receipt, gives it to any other person, in order to avoid the payment, every person being convicted before a JP, shall respectively be fined the sum of 10s. No person shall be charged any tolls, if passing through the turnpikes carrying any quantities of stones, gravel or other materials for mending of the said roads in the neighbouring parishes, or carrying through any dung, mold or compost for manuring of gardens or land, within the parishes where the road lies; nor shall any person pay toll for any carts or wagons carrying any hay or corn in the straw, to be laid up at the houses, barns or yards of the respective inhabitants of the parishes, nor for any ploughs, harrows, or other implements of husbandry, in use or repair, or any other husbandry items, for manuring and stocking of land in the said several parishes, nor shall any toll be demanded for any horse or cattle going to or returning from pasture or watering places, belonging to the respective farms of the neighbouring inhabitants, or for any post horse carrying the mail, or such horse used only to ride on by the owner or driver of any wagon, nor for the horses of soldiers passing, that are marching, or for carts attending them, or for horses, carts or wagons travelling with vagrants sent by legal passes. Any person who by law is chargeable towards mending the said highways in the parishes, where the roads are to be repaired, shall still remain chargeable, and do their respective works in the said parishes, as before. Every person chargeable towards repairing parts of the road lying in the parish of Woburn, Wavendon, Middleton Keynes, Broughton, Moulsoe and in the manor of Tickford, part of the parish of Newport Pagnell, shall perform three days of work, commonly called statute work, in such manner, place and time as the surveyor shall order, and shall not be again chargeable for the same by any surveyor of the respective parishes. The surveyor of every such parish shall yearly, within four days after request made to him by such roads surveyor, give lists of the names of every person in the said parishes who are chargeable towards repairing the highways, and what such person is chargeable with. If any Surveyor of the Parishes neglects or refuses to do as they are directed, he shall be fined the sum of 10s. and if any person keeping a team or other carriage, and chargeable towards repairing the highways, shall neglect or refuse to do three days work in the roads, he shall be fined the sum of 10s for each of the said three days such person did not work; and if any labourer or other person, chargeable towards repairing of the highway, shall at any time neglect or refuse to perform three days work, such person shall be fined the sum of 1s 6d for each of the said three days they refused to work. If it appears to the Trustees that any lands, or any rents or profits issuing out of any lands, tenements or buildings, are liable or chargeable towards mending the said roads, hereby intended to be repaired, such lands, tenements, and buildings, shall still remain liable and chargeable, and the possessors and occupiers of such lands, tenements, and buildings, are hereby ordered to pay such rents and profits to the said Trustees for repairing the roads, and for no other use. The Trustees may agree a price for the whole year with any person using the Turnpike, with any horse, coach, other carriage, for any sum of money to be paid quarterly, after such agreement shall be made. All penalties imposed by this Act shall be recovered by sale of the offenders goods, by warrant under the direction of any two or more JP’s of the same division, where any part of the roads to be repaired are, upon the information of any credible witness upon oath, and the warrant to be directed to the constables and tythingmen of the parishes, and the penalties when recovered, shall go towards amending the roads hereby intended to be repaired. Persons passing through the lane called Hockliffe Lane, will not be necessitated to walk in the grounds of the present Lord of the Manor of Battlesden. It shall be lawful for the Lord of the Manor to enclose his ground adjoining to the Lane, leaving out so much ground as the Trustees shall think fit to mark for the Lane so to be repaired, so that it does not exceed twelve yards in breadth in any one part of the Lane; and if the Trustees neglect to mark such ground twelve days after requested to do so by the Lord of the said Manor, then it shall be lawful for the Lord of the Manor, to inclose his ground adjoining to the Lane, so as he leave twelve yards in breadth, at least, for such Lane so to be repaired, which Lane shall be the common highway for all time. The tolls or duties hereby granted shall take place only from and after the 24th day of June, 1728, for the term of 21 years. 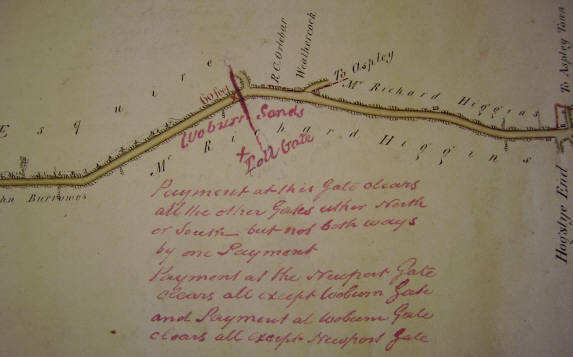 If at any time before the expiration of the term of 21 years all parts of the roads have been sufficiently mended and repaired, and so judged by the JP for the respective counties of Bedford and Bucks at their respective Quarter Sessions, and repayment of money advanced or borrowed, with interest, and the costs paid, the tolls shall cease. The lane called Hockliffe Lane, lying in the parish of Battlesden, leading between Hockliffe and Woburn, is only a common footway, horseway, and a way for driving cattle, and has been constantly maintained by the Parish of Battlesden at a very great expense, also a large and substantial causeway for passing of horses and drift cattle, in very good repair, but no other part of the said lane has ever been repaired by the inhabitants of the said parish of Battlesden, or any owner or occupier of land there. The said causeway shall, one year before the end of the term granted by this act, be delivered up to the said Lord or owner of the said Manor, or reputed Manor of Battlesden, for the time being, in good condition and repair, and well ditched, trenched, and fenced; and it shall and may be lawful to and for the said Trustees, and they are hereby required to order the collectors and receivers of the tolls, to pay during the last year of the term hereby granted, the said tolls to the Lord of the Manor, and in default of such order by the Trustees, the collectors and receivers, shall pay the same tolls to the Lord of the Manor of Battlesden, and such Lord of the Manor is directed to use the money for making good any defect of the causeway, but the Lord of the Manor of Battlesden shall be accountable to the Trustees, for such money as he shall receive and spend the said time, and pay any surplus he gets as the Trustees shall direct. Bridges and causeways shall be made and maintained cross the said way or lane, called Hockcliffe Lane, as are necessary and convenient for carts and carriages to pass to and from the Closes or lands in Battlesden aforesaid, lying on either side of the said Lane or Way. The tolls directed to be paid to the Lord of the Manor of Battlesden during the last year of the term, shall not be subject to the payment of any money to be borrowed upon this Act. But shall, during the said last year, be exempted and discharged. Parish of Battlesden exempted from repairing the Coachway and Co. Nothing in this Act contained shall make the Lord of the Manor of Battlesden, or the inhabitants of the said parish of Battlesden, liable in law to the repair of the said lane, the common highway, for the passage of coaches, carts, or carriages; but the said inhabitants, owners or occupiers shall remain liable to maintain a sufficient causeway for the passage of horses or other cattle through the lane, from the time that the causeway shall be left and delivered up in such plight and condition, and be ditched, trenched, and fenced. The Trustees will pay all such debts and sums of money due to any person, either for money lent upon credit of the said Act of the fifth year of the reign of her late Majesty Queen Anne, or for any stones, gravel sand, or materials, delivered or taken pursuant to the same Act or otherwise, out of the tolls hereby granted, or out of the money to be advanced or borrowed upon the credit of this Act. The receivers and collectors appointed to receive the tolls shall be accountable to the Trustees for such of the said Tolls as they have received, and which shall remain unaccounted for by them at the time of the Commencement of the Act; and shall pay over the money to the Trustees, to be applied for such purposes as the tolls and duties hereby granted are hereby directed to be applied. If receivers or collectors shall neglect or refuse to account and pay over the monies, he shall be liable to such pains, penalties and forfeitures as any receiver or collector appointed for this Act, is hereby made liable so, in case of not accounting for the money by him received. The said receivers and collectors shall have allowances in their respective accounts, for such sums of money as they have paid or shall pay before the commencement of this Act, to the present Lord of the Manor of Battlesden. In pursuance of the said recited Act; and that sums of money received by the Lord, or that are due to him by virtue of the same Act, shall be received and held by him for the purposes in the Act, but subject to such account to be given, as is directed to be given by him for the tolls payable to him for the last year of the term granted; and the Lord of the Manor, and the collectors and receivers are hereby indemnified in respect of such collection, payment and receipt. The JP, at any General Quarter Sessions to be held yearly after the said 24th day of June, 1728, can appoint persons to survey or view the ruinous roads directed to be mended, and to enquire of the tolls taken and received, and in case such person or persons appointed shall find misapplication of the money collected by this Act, or any other abuses of the powers and authorities, such persons shall certify the same to the JP’s at their General Quarter Sessions, who are hereby authorised, to hear and decide the same, without further or other appeal; and all such sum and sums of money as the said Justices shall thereupon think fit to order or direct to be paid or given, shall, by the person or persons making such misapplication, or committing any such abuses, be paid to the treasurer of the said turnpike or make good such satisfaction given, within ten days after such determination. And if they don’t, it shall be lawful for the Justices, at their next General Quarter Session, after such determination, obtain the money by sale of the offenders goods, returning any extra after deduction of all costs, to the person or persons so neglecting to make such payment, and if the is insufficient goods to be found for that purpose, to commit the person to the common goal of the county where such offence shall be committed, there to remain without bail till payment be made, or for a period not exceeding twelve months, as the Justices shall judge. A sufficient number of fit and able persons will be Trustees for managing this Act, and it shall be lawful for the Trustees, upon the death of any of the Trustees, or upon any of their removal, or refusing to act in the Trust, to elect and appoint a fit and able person, living in the said Counties of Bedford or Bucks, to join the Trustees in the execution of all their powers, giving public notice in writing, to be fixed up at the respective gates or turnpikes where the election shall be held, at least ten days before election, and all persons chosen to join in putting in execution this Act, shall act in the proper manner. The Trustees appointed to put this Act into execution shall meet together at the sign of the George in the town of Woburn, on or before 24th June, 1728, and shall afterwards meet there, or at any other place near to the said road to be repaired, as often as it shall be necessary for the putting this Act in execution. And if it shall happen there shall not appear a sufficient number of Trustees to act at such meeting, then the Clerk to the Trustees, by notice in writing to be affixed at the respective gates or turnpikes, shall appoint the said Trustees to meet at the house where the meeting of the trustees was last appointed to be held, or at some other convenient house near the roads directed to be repaired, on that day three weeks upon which last meeting of the Trustees was appointed to have been held; and that the Trustees at their first meeting, and at all their subsequent meetings, shall pay their own charges and expenses. No person appointed by this Act a Trustee for putting this Act in execution, shall have or accept any profit arising out of the tolls or duties by this Act granted; but such person shall be incapable from the time of accepting of such place of profit, of acting as a Trustee, under this Act. All actions, suits, informations, or prosecutions against any person for any matter, which he does to cause to be done in pursuance and execution of all or any of the powers of this present Act or in relation to the premises, shall be commenced within six months next after the fact committed and not afterwards, and shall brought in the counties of Bedford and Bucks, where the cause of action did arise; and the defendants in such actions may plead the General Issue, Not Guilty, and give this Act and the Special Matter in Evidence at any trial to be had, and that the same was done in pursuance, and by the authority of this Act; and if the same shall appear to have been done, or if any such action shall be brought after the time limited for bringing the same, or shall be brought in any other county, then the Jury shall find for the defendants; and if the plaintiff shall become nonsuited or suffer a discontinuance of his actions, or if a verdict shall pass against the plaintiff, or if upon Demurrer Judgement shall be given against the plaintiff, then the defendant may have treble costs, and shall have like remedy for the same, as any defendant has for costs of suit in any other cases by law. And be it further enacted, that this Act shall be deemed, taken, and allowed to be a Public Act, and all Judges, Justices and other persons whatsoever, are hereby required to take notice thereof as such, without specially pleading the same. End. Printed by John Baskett, Printer to the King’s most Excellent Majesty, 1728. As mentioned, the Act was renewed in 1742, for a further 21 years. This was a much simpler Act, as it just had to lay out the new period that the Act was in force for, and reiterate who had powers. In the reign of King George II , at the Parliament held at Westminster, the 1st December 1741, and from thence continued by several Prorogations to the sixteenth Day of November 1742, being the 2nd Session of this present Parliament. 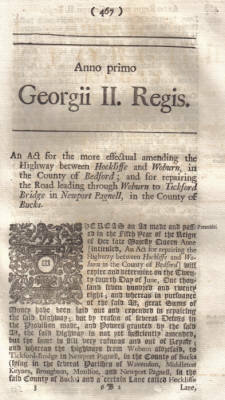 An Act for the enlarging the Term and Powers granted by an Act passed in the first year of the reign of his present Majesty for the more effectual amending the highway between Hockliffe and Woburn in the County of Bedford; and for repairing the road leading through Woburn to Tickford Bridge in Newport Pagnel in the County of Bucks. Preamble, reciting the Act I Geor II. 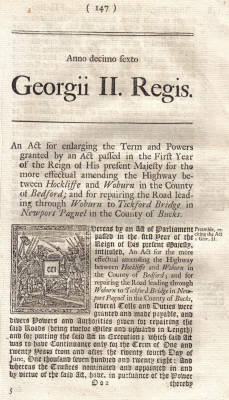 An Act of Parliament passed in the 1st year of the reign of his present Majesty intitled, “An Act for the more effectual amending the highway between Hockliffe and Woburn in the County of Bedford; and for repairing the road leading through Woburn to Tickford Bridge in Newport Pagnel in the County of Bucks”, several tolls were granted and made payable, and powers given for repairing the roads (being twelve miles and upwards in length) and for putting the said Act in execution; which said Act ran for the term of 21 years from 24th day of June, 1728, and the trustees appointed in the said Act borrowed a considerable sum of money upon credit of the Act, which, together with the tolls collected, have been duly applied, according to the Directions of the said Act, and great progress has been made in mending the said roads; but the same cannot be effectually kept mended and repaired, and the money borrowed for repairing the roads be repaid, unless the terms and powers by the before mentioned Act be continued and enlarged, and the said Act made more effectual: So that the said Roads may be kept in sufficient repair, and that the money due and owing on the credit of the said former Act be repaid; may it please your Majesty that it may be enacted, with the Advice and consent of the Lords and Commons, in this present Parliament assembled, and by the Authority of the same. Trustees empowered to put this and the said former Act in execution. Trustees appointed or elected, by the said former Act, are hereby appointed Trustees for putting this present Act into execution. The before mentioned Act and all Authorities, Powers, Penalties, forfeitures, and clauses contained (except such clauses, matters and things as are hereby altered) shall continue in full force, from the expiration of the term by the said Act, during the further term of 21 years, and from then to the end of the next session of Parliament, in full, as if the before mentioned Act were again repeated and re-enacted in the body of this present Act. But if at any time before the expiration of the said additional term of 21 years hereby granted, all the said roads shall be sufficiently mended and repaired, and so adjudged by the JP for the counties of Bedford and Bucks, assembled at their Quarter Sessions, that the several tolls granted by this Act shall cease, after repayment of all such money due upon the credit of the said former and this Act, together with interest. 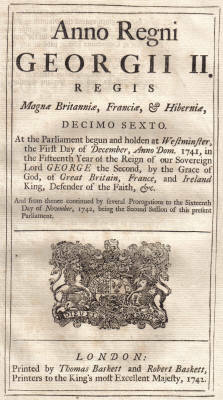 The 1742 continuation Act, front page above, and first page below. So that the sum borrowed at one time, on the credit of the said former and this present Act, do not together exceed in the whole, the sum of £2500, which said sum of money so to be borrowed, and all such sum and sums raised and collected in pursuance of the said former and this present Act, shall (after the charges and expenses of passing this present Act) be applied and disposed of for amending the roads directed to be repaired by the said former and this present Act, and for such other purposes as are mentioned. From the said 24th day of June 1743, the property of all the turnpikes erected by virtue of the said former or this present Act, shall be vested in the said trustees appointed, to put the said Acts in execution; and they are hereby authorised and impowered to dispose thereof, as shall think proper, and bring actions, and prefer Bills of Indictment against any person who shall steal, take away, break down, or spoil the same. The Trustees shall order and direct the roads to be exactly measured and at the distance of each mile, or other distances, stones or posts to be erected and set up near the side of the said roads, and thereupon denote the distance of each mile, or such other distances as they shall judge convenient as it may be of great service to have the roads measured, and divided into equal proportions. It shall be lawful for any of the said Trustees, who are in the Commission of the Peace for the Counties of Bedford or Bucks to act as a Justice of the Peace in all cases, matters, and things that may be necessary for the more speedy and effectually putting into execution the powers in the said former and this present Act. All costs and charges expended in of passing this Act of Parliament, and all money due upon the credit of the said former Act, or owing for any materials delivered, or otherwise due on account, shall be paid out of the monies collected, or borrowed by virtue of the said former or this present Act. This Act shall be a public Act, and shall be judicially taken notice of as such by all Judges, Justices, and other persons whatsoever. End. Printed by Thomas Baskett and Robert Baskett, Printers to the King’s most Excellent Majesty, 1742. The Act was later renewed again in 1779, 1800 and 1821. It eventually closed in 1877. As a side note, here are three letters published in the Monthly Magazine for 1824 and 1825, between Mr W. Castleden of Woburn and J. M. Lacey of London. I have not been able to find Lacey’s first letter, but obviously, he had written disparaging remarks about John MacAdam’s new road laying technique. The method simplified what had been considered state of the art at that point. Single-sized aggregate layers of small stones, with a coating of binder as a cementing agent, are mixed in an open-structured roadway. It’s interesting to note that Woburn had already applied this process to its roads, despite local opposition. To the Editor of the Monthly Magazine. Sir: According to your invitation in p. 413 of your Magazine for this month, I cheerfully forward you my mite of contribution, on the new roadsmaking, or McAdamizing system. J. M. L.’s, echoing animadversion, on the statement of Mr. McAdam’s finding the plan answer well in the country, “That he finds it answer well, there can be no doubt,” I must say, understanding, as everybody must, the feeling which could dictate this repetition, that I am persuaded, whatever the little spirit of jealousy or envy may prompt to the detraction of such a man, posterity (human, and animal, if the latter could,) will unite to erect a monument to him, far more worthy of attraction than the Achilles of Hyde-park, with all the tears of the widow and fatherless which it records. You must know, Mr. Editor, our little pleasant town of Woburn, within the last six months, has undergone the operation of McAdamizing. At first, some of my neighbours were grievously displeased that the good old large stones should be taken up and broken in pieces: stones, which one of the Dukes of Bedford, nearly a century ago, at his own expense, caused to be brought from that land of which Mr. McAdam is an ornament. On their removal, many, very many, hard words were uttered, and much clamour about “dust in summer, and mud in winter;” the only objections of any moment I have heard produced. Winter comes; and, sure enough, as it approached, we had mud in abundance, but good broad scrapers removed it to the sides, and then all was clean again. Then stages and waggons were in perpetual progress, and on the rains descending, their pressure brought up thick mud again. This being removed, another layer of the broken granite was thrown thinly on; and now, we have had no scraping, to the sides of the road, for nearly a month past: and though, so far as wet weather is concerned, we have had as much winter as we may reasonably expect, we have little more than a thin dirt on the surface, not deserving notice. All is hard and smooth, and carriages bowl along in a delightful style. There is, Sir, one of your correspondents, whose name I am happy to see, in your pages of this month Mr. Farey. He knows Woburn, and the materials, round it, for road-making, well. To that gentleman, Woburn is much indebted for very many useful improvements, when he was steward under the late “Great Duke of Bedford.” To Mr. F. we are obliged for our neat and commodious footpaths, begun and completed at no expense, I believe, but the mere labour. Not less useful is Mr. McAdam likely to be to us. May prosperity attend them both, and every improver of his country, whether he may excavate roads below, or cover them above! And pray, Mr. Editor, can we have any roads without labour? or permanently good roads, without temporary inconvenience? You know well the metropolis, that place of my birth – what would he the condition of its streets, were it not for the constant employ of its scavengers? Now, only let us wait, and give the new system a fair trial; and I shall be much mistaken if, in all your London, as well as country streets, we have not less of dust to subdue, and mud to remove. For when, in summer, our watercarts come into action, the advantage of the new over the old roads and streets will be apparent; for as water falls on the granite dust, one of the strongest of cements, it will fill up the interstices, and bind, in one immovable mass, the small angular pieces below. Living, as I do, directly fronting the main street, being six yards across, the usual-width, I believe, of the McAdam roads in the country, I have watched its condition every day. You are aware, Sir, that Woburn is on the high-road to Manchester and Liverpool; consequently, we have great numbers of stage-coaches passing day and night – not less than twenty four in the twenty-four hours. Now, as all these coaches, with great numbers of other carriages, have narrow wheels, it is notorious how adapted they are to cut through the hardest road, running, as they do, exactly on the same track; yet have we hardly the marks of the wheels, much less ruts, between here and Dunstable, although we had them so plentifully before. Sir: The letter inserted in your last number from Mr. Castleden, of Woburn, calls for some reply on my part; but before I come to that, I think it will be as well to state, that my letter, inserted in your Magazine published on the 1st of December last, and appearing to remark on one by S. W., that had been inserted in your number for November, was in fact written upwards of a year ago, and the letter which caused it, formed a part of the Monthly Magazine, published November 1, 1823. This, of course, your readers could not know; and as a change (or more than one) has taken place in the Editorship, possibly you did not know it yourself. I had, indeed, almost forgotten my letter on the Macadamizing system; and I only recur to the fact of its being written so long back, to shew that it might be very likely I should have one opinion of Macadamization in November 1823, and a very different one in November 1824. I say, it might be, for at the first period the system was little more than talked of in London, and had been adopted but in very few instances indeed. My letter was, therefore, entirely anticipatory; but it does not require any supernatural gift now, to see that the plan will not do well for the streets of London generally. Still it is something curious, that my year-old letter not only passed muster in the respectable pages of the Monthly Magazine, but, was also copied into some of the Morning papers from thence, as a letter written during the month of December last; so nearly did my presumption agree with the then state of the Macadamized streets of the metropolis. So much for the time when my letter was written. And now, with regard to Mr. Castleden’s opinion as to the feelings with which I remarked on Mr. Macadam, when I said, “That HE finds it answer well, there can be no doubt.” I still think the same as to the country roads which he has made or mended; but as to some of his contracts for town streets, I fear he will eventually be a loser; for he will find them swallow up more granite than he expected. It is a trite remark to say, “Save me from my friends;” and I think Mr. Macadam may say this of Mr. Castleden: for, as he has pressed the question, I will ask any thinking man, whether the former has or has not found this thing answer well, when he knows that he had some thousands voted to him by parliament, to repay him what he had expended in posting over England, &c., for the sole purpose of looking to, and mending, our ways. If he did spend so much in posting, and I really cannot say he did not, he is certainly the most Quixotic north-country gentleman that ever travelled so far south, – and the luckiest, to have got it so repaid to him. Still I beg to assure Mr. Castleden, and all whom it may concern, that it is neither “jealousy” nor “envy,” towards Mr. Macadam, that ever led me to make one remark, either on him or his plan. So far from it, that I say, in my former letter, it is excellent in the country and I even admit, that in some parts of the metropolis it may do very well. It may not be improper here to state, that I am a commissioner of pavements, in a large and important parish of Westminster, where a considerable part of the inhabitants are not overburdened with riches, and who think themselves sufficiently loaded with rates and taxes; and I certainly did feel, when the first great “hue and cry” was raised some time back, about the wonderful Macadam and his plans, that I, as well as every other man placed in my situation, as guardians of the funds of our neighbours, raised for a particular purpose, ought not to yield to the first impulse of clamour in favour of a scheme that was sure to be very expensive in its outset, and which I then thought, and still do think, likely to be very uncertain in its result. Yet there were not wanting some at the board of which I am a member, who were for plunging into the fashion of the day, and trying the Macadamization of some of our streets, at once. I certainly opposed anything like an early adoption of it; my motto was at least a safe one, “Wait”, and after having done so for one year, I still say, “Wait” for the thing, as to its succeeding in London, is by no means proved. About the time I mention, S. W’s letter appeared in the Monthly, and being an occasional correspondent of that work, I ventured to throw together my loose ideas on the subject, and really, nothing has happened since to shake them materially. Still it is very far from my desire to exclude improvement, especially where it is said it can be had cheaper. I am therefore still waiting for conviction, while the roads are left for execution. I was more than a little pleased to see, in a note, and in the postscript to Mr. Farey’s valuable letter in your last number, a remark or two that bear upon the point in question; and, in my estimation, coming from a mind so capable of well appreciating this matter, these are worth more than all the clamour that there has been, or may be, about it; and, inasmuch as they uphold opinions which I have formed, and publicly expressed, are gratifying. It is also singular, that Mr. Castleden, who is angry with me for what I have said, has given us an eulogium on Mr. Farey, with every word of which I most cordially agree, though, unfortunately, that individual seems decidedly opposed to him in his views of Mr. Macadam, and his said-to-be new invention. In my first letter I said, “The breaking of stones to form roads is no new thing” in this, Mr. Farey completely bears me out, by his forcible remark in the note above mentioned; where he says, that it has been a practice “of thirty or forty years’ standing, and pursued as long by scores of roadmakers, from whom this good practice has been borrowed; yet the public mistakenly lavishes its praises and emoluments on an individual, as being its inventor. So much for its novelty; and now for Mr. Farey’s other idea, that of the illegality of ‘breaking up the pavements to make roads: I agree with him in thinking it illegal, and not at all within Mr. Michael Angelo Taylor’s act, nor any local act that I am acquainted with; yet, in saying this, Mr. Farey must not consider it as coming from a legal man, but from one who considers plain common sense to be as able to understand such a matter as most lawyers. M. A. Taylor’s act is a terribly voluminous one, but there is nothing in it, which I am aware of, capable of being construed into an empowering of commissioners to turn streets into roads; the commissioners are’ empowered to pave and repair; and the only words that could in any way be strained at all towards such a meaning, are “other materials;” but which are used thus, when the pavements, &c. &c. are vested in the respective commissioners of parishes “And also, that all and every the pavements, stones, posts, and other materials, which now are, or which may be hereafter, placed in the foot or carriageways, &c.” and the same words are afterwards used repeatedly, but always in the same general way. How far commissioners may be subject to indictments or criminal informations for their acts, I must leave to someone better learned in the law to decide; but I think it will be found that they are personally irresponsible, and that the parish, as a body, would have to defend them: but I do think, what Mr. Farey suggests about an appeal against the paving-rate, if so misapplied, would be very likely to succeed, at least under the general act; for it is not unlikely, that in some of the local acts it may be different; and they are all expressly excepted in M.A. Taylor’s act; and in local acts certain estates are very frequently excepted, as, for instance, in that for the parish of St. Clement Danes, assed the 23d of Geo. III; Clare-market, then the property of the Duke of Newcastle; and certain approaches to wharfs, then the property of William Kitchener, Esq., progenitor of the present celebrated Dr. Kitchener, were expressly exempted from its operation, an continue to be so to this day. In trying the few streets they have on the new plan, the corporation of the City of London have acted wisely, and it is to be hoped they will give the thing a fair trial; but one thing should not be forgotten by the managers of other laces, which is, that the commissioners tor whatever they are called) in the city, have the whole of its paving fund: at their disposal, and are not, as is the case in Westminster, confined to parochial districts; consequently, if it eventually should not succeed, the burthen will be light, in comparison of what it would be in a single parish. It is to be hoped, that very correct accounts will be kept of the expense of the tried streets for some given portion of time, say three years, so as to enable other parishes and places to avail themselves of such information; and in doing this, I trust the value of the pavement taken up and broken will not be forgotten; for at present I do not think that is much thought of, and yet it forms a large part of the expense. As my letter has already stretched to a greater length than I at first intended it should do, and as I do not wish to give what I think a falling system a greater impetus in the present opinion of the public than it has already, some would-be wits even calling it Muckadamization, I will just conclude with remarking on Mr. Castleden’s letter respecting the town of Woburn, that I think, as far as he wishes to compare the Macadainization of that place with the same thing in the metropolis, it is like a parody without parity; and really, it is impossible to help smiling, when he speaks of the enormous quantity of stage-coaches which pass through Woburn, “not less than twenty four in the twenty-four hours!” Let him stand on Blackfriars-bridge (and our metropolitan bridges are the places where I expected the system to succeed) for ten minutes, during almost any time of the day, and though he may not see twenty-four stage-coaches, he may see more than twice twenty-four carriages pass, and nearly all of them of a heavier description than stage-coaches, and many with as narrow wheels. I am not at all surprised at Woburn being pleasanter in a Macadamized state, than with the old rumble-tumble pavement; I stated in my first letter, that it was the best plan for the country, and I here beg leave to repeat the same thing: but, after all, Mr. Editor, you are right, it is a local question, and as such it should be treated; and you act very properly in calling upon your correspondents to contribute their mites to the pro and con of it; though I must confess, that the scenes of mud we have had upon the Macadamized part of our streets, during the first part of the present winter, leave my mind, for the present, very much on the con side of the question. Mr. Castleden appears to have some wish to erect a statue of brass to Mr. Macadam, that shall be more worthy of notice than even the celebrated Achilles, of Hyde-park notoriety. ‘To this, of course, I can have no objection; but he seems to think that the animals would join in the work, if they could. Now, I rather doubt this; for if the newspapers are to be believed, very many valuable horse have been recently lamed by the sharp angles of the broken granite, but as I do not do the fact of my own knowledge, I lay no great stress on it but at the same time think it not improbable. I assure Mr Lacey, Mr Macadam is altogether unknown to me, save by his works. That our gentleman surveyors, as well as non-surveyors, of roads, have thought the best system for road making would be the breaking of the large stones into smaller, there can be no doubt: But, who has acted as well as thought? – Mr Macadam. As to monies improperly voted to, or expended by, this gentleman, that is an account to be settled by Mr. M. and Mr. L. But, that Mr. Macadam was the first to act upon the new system, no one acquainted, for the last fifty years, with the metropolis and country of this great nation will hesitate to affirm. Then, “without grudging,” let him have and wear his palm – and let honest John Bull, and all his family, add their generous acclamations – admiring our free country, where talent and enterprize are sure to meet encouragement and support, and to which the pages of the Monthly Magazine have amazingly contributed. You perceive, Sir, Mr. Lacey scarcely touches one of the facts which I have communicated, through you, to the public, save and except the twenty-four stage-coaches which push the twenty four hours, heavily laden, with cutting narrow wheels, along the narrowest part of the street in Woburn. This, with a smile, affords Mr. Lacey an opportunity to ‘“invite me to take my stand on Blackfriars Bridge and, for ten minutes, during almost any time of the day, I may see twice twenty-four carriages pass and nearly all of them of a heavier description than stage-coaches, and many with as narrow wheels.” This, I beg leave to inform Mr. Lacey, I have repeatedly done, and on Westminster Bridge too, and sincerely thank him for the recollection: for it at once makes the fact which I adduced in proof of the superiority of the Macadamizing system triumphant. I hope this truly odd way of meeting a fact will fix the attention of many, as they pass over the bridges; and they will then see, as in Woburn, and on along length of way, wherever this new mode may be adopted, in a little while broken moment and ruts, those great nuisances and impediments to comfort in travelling will be for ever done away: – to say nothing of the vast expense saved in wear and tear of carriages of all descriptions. Your correspondent, in the 105th page, touches a string which vibrates through the whole body of commissioners of highways or byways, in and out of London; and which, if I be not-mistaken, will have a tenfold shock, when receipts and expenditure of turnpike gates, as already moved, become matters of investigation in a committee of the House of Commons. With that correspondent I cordially unite in saying, it is indeed strange, that the principles of the new system, being so plain and obvious, should meet with any opposition – But is there not a case for this opposition? We shall see. I will remember some years ago when professional duties used to call me annually to your great city, passing frequently, in a light carriage the whole length of Holborn exclaiming “Oh! these miserable, noisy, comfort-destroying, stones! How many invalids have you shook and hastened to their tombs!” What lacerations and tortures to the most useful of animals, the horse, has the smooth and often irregular surface of Holborn-hill inflicted! No street, from top to bottom, for its width, is so well adapted for the new system. We all remember with what the gaslight have to contend. Here and there was mounted a blazing lamp and people as they approached exclaimed “Bless me, what’s that?” until by the gradual advance, prejudice and opposition fled before them as the darkness or error always flies before the light of truth, and the system becomes universally adopted.